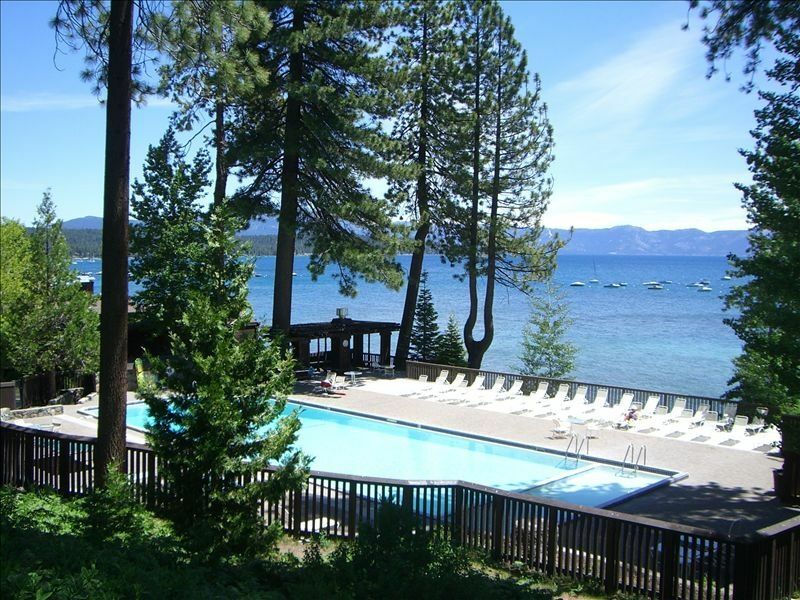 Deluxe Tahoe Tavern Rental - Beach, Pier, Pool, Tennis & Wi-Fi! This beautifully remodeled rental is conveniently located just 1/4 mile from downtown Tahoe City and is a part of the deluxe Tahoe Tavern Properties. The kitchen has all new cabinetry, appliances, granite countertops and slate flooring. Also both bathrooms have been recently renovated and include granite and marble countertops with travertine tile flooring. The unit has a single floor layout that is spacious with a cozy open fireplace. It has been beautifully renovated with mountain decor and is very comfortable and clean. Off the living area, there are sliding doors that lead to a private deck with seating area and a gas grill for barbecues in the summer. There is also a private walkway that leads to the condo with a secluded grass area. The property is beautifully maintained and is situated along the lakeside of the highway. On-site amenities include: tennis courts, ping-pong, heated lakeside pool, beach, pier, buoys, and a sledding hill. Tahoe City is just a short ten-minute walk along a lakeside trail. ONLY 10 MINUTES TO ALPINE, SQUAW AND HOMEWOOD SKI RESORTS! The townhouse is a non-smoking unit and does not allow pets. Squaw, Alpine Meadows and Homewood are within an easy 10 minute drive. We had a very comfortable stay. The unit is at the back end of the property, and very shady. The unit is a bit dated, but comfortable and equipped just fine. Owner was generous to allow us a late check out of 12:30. We had a nice time, but not used to doing the cleaning and laundry before leaving. Glad you enjoyed your stay. Just to follow up on your check out, we follow the same as the local real estate offices for check out policies. Our cleaning rate is also well below standard cleaning rates in which we allow for 3 hours, so we ask our guests just to start a load of laundry and to tidy things up. Our house cleaning service does the deep cleaning, vacuuming, finish laundering as well as make all the beds. This also allows for us to extend later check outs as well as allow earlier check ins which we gladly try to accommodate. Nicely appointed condo in a great old Tahoe development. POOL, tennis courts, great pier, but no useful beach. Buoys may be available to rent with valet. Perfect for one couple and two children. Everything you might need available in the kitchen and laundry. Master bath is tiny. Hall bath needs a better shower head. Nancy was most helpful and brought us a couple of chairs for the deck. There is no lake view. Would be perfect for a winter get a way. This is a very pretty, comfortable place. Facilities of Tahoe Tavern are excellent. This townhome is very nice and perfect for 5. Private setting. Nicely appointed with modern and well stocked kitchen. Living room and bedroom have nice furnishings. Great WiFi. 2 TV’s . Owner extremely responsive and easy to reach. Everything was perfect, exactly as described. Couldn’t have been nicer. Loved lounging on the dock and walking to town. Thank you!! This condo exceeded our expectations ... last weekend we stayed just down the road and did not have a great experience. We arrived late on Friday night and easily found the condo (great directions from Nancy!) ... and the walkway was shoveled. The upgrades are done in all the right places. The kitchen is well appointed and upgraded, the beds were comfortable and the bathrooms were just right for the three of us. Very nice place and well furnished. All rentals are charged a cleaning fee depending on the number of guests in your group. Please inquire for cleaning fee.